Good Morning – As always, bad news sells, and we’re seeing the horrific pictures of the Florida weather disaster being replaced by talking head explaining how horrible the markets are. So, let’s have a big-picture look at things, and then I’ll provide a chart of the technical areas we’re watching. We normally expect consolidations and tests of prior levels during a bull market, and we have recently reduced risk in our portfolios at signs of market weakness. We have eliminated real estate holdings which have now been hit pretty hard, and have significantly reduced our exposure to tech areas. These have proved to be good strategy so far. Nevertheless, the current pullback appears to have left no areas untouched, and even we were surprised at how quickly markets pulled back from all-time highs. The chart below will show that we’ve been at this point multiple times in the past five years. The strong support of the ‘market’ has again been breached. This is an expected and logical place for a bounce, and it appears so far that we’re seeing a bounce today. What happens next, however, is extremely important. This is a five- year picture of the ‘market’ as represented by the S&P500 Index* ( (from StockCharts.com). Please note several things. First, we are unquestionably in an up-trending market. 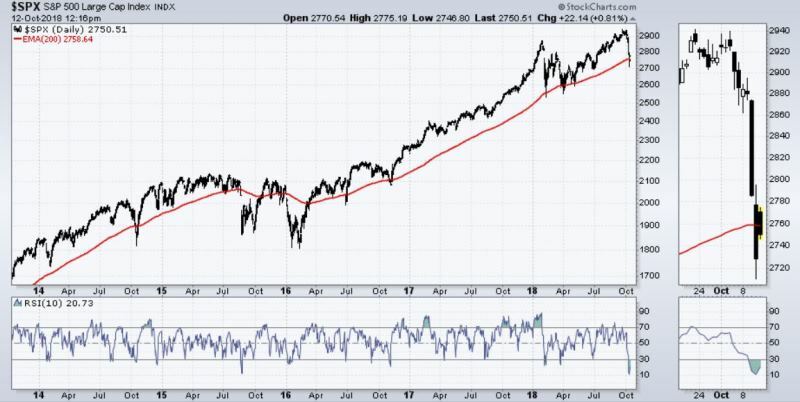 Next note that the red line which is the 200-day moving average (200MA) of the daily market value has (as usual) served as a generally reliable measure of the support level. In other words, historically when the market level gets down to the 200MA, buyers perceive value and step in to buy stocks, and this pushes the levels back up again. I’ve enlarged the recent couple of weeks in a thumbnail to the right of the main chart to make it clear how the market levels have bounced at the 200MA over the recent past. Then please note the chart (below the main chart) labelled RSI. This is a momentum indicator that measures the magnitude of recent price changes to analyze overbought and oversold conditions. When a market is overbought the indicator will be above 70. Given that condition of the market, the next likely move then is to pull back. (Check that out visually please.) When a market is oversold the indicator will be below 30. In that case the next likely move is for the market to bounce back up. I count sixteen times that the daily measurement has shown the ability to bounce off of the RSI 30 measure. The thumbnail shows a close-up of the current situation. During long-term uptrends, short-term corrections many times result in RSI readings at or near 30. From the chart above, you can see that our current weekly RSI reading is at just below 30. Markets could reverse and move right back towards recent highs at any time. Our expectation is that markets will stabilize and resume their upward trend somewhere around the current levels. This is not, however, any sort of guarantee, and markets can continue to move down before they bounce. We carefully read the technical indicators and act accordingly. The market’s actions on any particular day are unknown, although the most likely scenarios are usually what actually happens. I’d like to point out that Buffet recommends that this is a good time for those with cash to be a buyer of stocks. Market Minute – Did Someone Say Volatility? What about the recent volatility? This as it turns out, is not a unique situation. Wednesday, 10/10, the S&P 500 was down 3.29%, a notably bad day for the market, but also far-from-unheard-of. In fact, we’ve had 71 worse trading sessions since 1957 (when the S&P 500 started holdings 500 stocks), two of which occurred earlier this year. On average (as the table below shows), we’ve seen positive returns, over both the short and long-term, following such an event. The table below analyzes the top 100 worst trading days since 12/31/1956, and categorizes them by structural market type (Bull or Bear). The “AVG PERIOD” row provides insight as to what the market did for the average 7-day, 1 month, etc. period over the entire time frame. The takeaway here is not that we or you should ignore the charts, the indicators, or what the market is doing. The takeaway is that we stick to our process. No one needs a process when things are going well. Processes are designed for when the boat hits the rapids, or even the rocks. None of our processes have raised the flag indicating that it’s time to abandon the domestic equity ship. We are continuing to watch the indicators. And we have a plan that will indicate the reasonable action, whichever way the markets go. However, we won’t jump the gun on processes that have guided us through situations just like we have today. Note – Data courtesy of Dorseywright.